First full week of school is finally here. . .and gone! It is about this time that students-and teachers-begin to find their strides and personalities begin to emerge. I must say, I’m so thankful for the wonderful classes I have this year. While large in comparison to previous years, the students are focused, polite, and ready to participate every day. 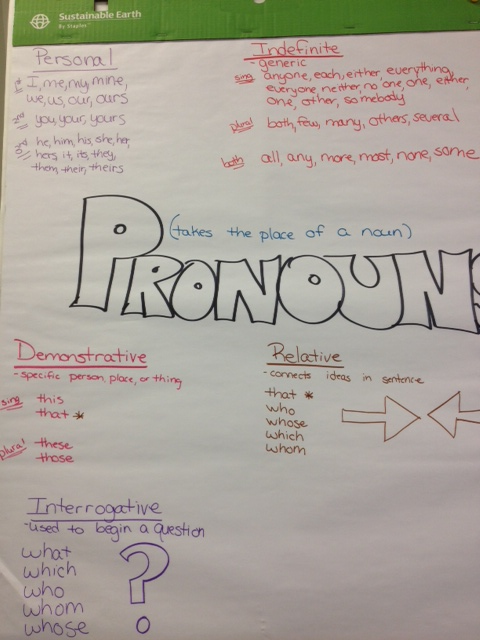 We rounded out our pronoun discussion today with indefinite, demonstrative, relative and interrogative pronouns. After our break today, the students took their first exit ticket over nouns and pronouns. I think it was quite an eye-opener for most. There was no multiple choice or matching. We are trying to model our assessments after the PARCC assessments that will take over ISTEP next year. I will begin grading the Exit Tickets over the weekend (when my children cooperate or sleep). 🙂 Once they are graded, I will add that grade to RDS based on the 1-4 proficiency scale. Keep in mind, if a students receives a low score, they will have the opportunity to improve and the lower grade will be erased. Monday will be the first formative assessment on Text Structure and Media! Stay tuned!